The finest-known example of the 1866-S “No Motto” Type I $20 Liberty was the gem out of the some 1,400 gold coins found by a Northern California couple buried on their property. 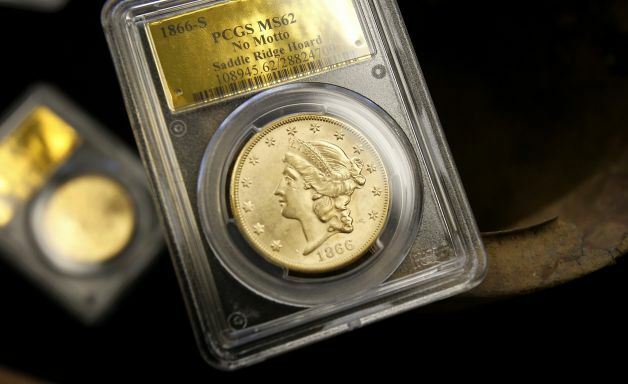 The coin could claim more than $1 million at auction. The overall value of the “Saddle Hill Hoard” treasure is roughly $10 million. In this edition of the Antiques Auction Forum, I host an exciting interview with Kagins Inc.’s, Donald Kagin, PhD, and David McCarthy, who are handling a once-in-a-century find—The Saddle Ridge Hoard; $10-million worth of rare gold coins—that was buried sometime in the late 1800s and recently discovered by a couple out walking their dog on their own property in Northern California. Listen in for a behind-the-scenes account of this unprecedented event and how it will unfold.